1. Don't rush it. This is probably the most important tip of all. Forget about when you or anyone else thinks potty training should happen for your kid. You will be marching down a frustrating, highly soggy road if you try to potty train a kid who is not ready. Look for readiness signs (e.g., they can identify when they have a soiled diaper, show interest in the potty and wearing underwear, etc.) before you think about starting. 2. Gear up. Some people like a potty seat that sits on the floor, but I prefer using a toilet seat + step stool combo. No need to wash out a bowl (yuck) and then you can use the step stool for hand washing. I also recommend keeping a stack of books in the bathroom (they can be a helpful distraction so your child can relax and let go of #2) and a magazine for yourself if your child likes to sit and hang out for long stretches of time. Finally, we have a PiddlePad in Vi's carseat in case of accidents, since cleaning the whole cover is a pain. 3. Forego pull-ups. Yes, they prevent messes on your floor but they're confusing for kids. Plus, kids will be more motivated to use the potty if they feel the discomfort of soggy underwear. I ordered a dozen thick cotton training underpants for Violet and they've worked great. 4. Hold onto the diaper for sleeping time. Sometimes kids have trouble letting go of #2 in the potty so the diaper at sleeping time helps them let go. When we potty trained Laurel, we held onto the night time diaper for a long time, mostly because I didn't want to have to change accidents in the middle of the night. The good news? It meant by the time we dropped night diapers for Laurel, there were no accidents. I'm planning on following suit for Vi. 5. Pick a weekend where you have nothing to do. Stay close to home and be prepared for accidents. It's all about mindset. If you're not trying to race around and do a million things, the accidents won't be as big a deal. 6. Stick with it. Consistency is the key to so much of parenting and the same goes for potty training. It will be confusing if you deviate from rules and potty training will happen faster if you stay consistent using regular underwear except for sleeping time. 7. Split the work. 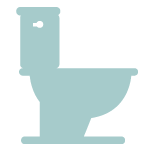 If you have the benefit of a partner and/or older child at home, split the work of bathroom visits. You'll be less grumpy if you don't feel like you're spending the entire day in the bathroom! Mostly, Vi wants someone to sit in the bathroom and read to her. Anyone can do that! At the beginning Jon and I helped her with the other business (bottoms on and off, wiping) but now she wants to do that herself. Awesome. 8. Stay positive. Frustration is inevitable but try to stay positive and encourage your child along. If they sense you getting angry at them because of accidents it may lead to constipation or other issues. Just handle accidents in a matter of fact nature and move on. Not even kidding, by the end of one weekend, Vi was using the toilet consistently and telling us when she had to go. There were a handful of accidents in the couple of days following the weekend, but since then, it's been smooth sailing. By one week later we were out and about doing our normal things with her in underpants. We do bring back up underwear and pants just in case but haven't needed them so far. WOO HOO! 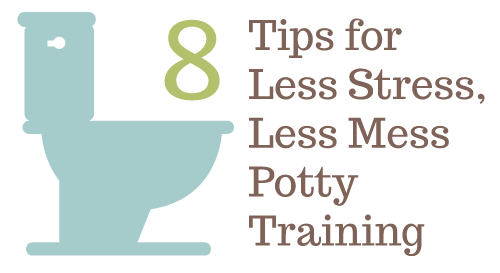 Do you have other less stress, less mess potty training tips? Feel free to share in the comments below!